SPECTRE Arts is a venue for the visual and performance arts in Durham, North Carolina. Located in the downtown Golden Belt Historic District, it is a neighbor to The Cotton Room, Golden Belt and Liberty Arts Warehouse. 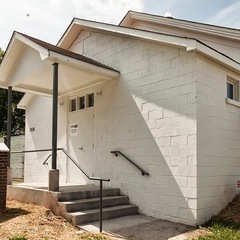 The organization’s historical building was constructed as a church in 1910 and was used for this purpose until late 2011. After a year and a half of renovations, the space has been revitalized and now includes artists’ studios as well as exhibition and performance spaces. Through a variety of programming, SPECTRE Arts aims to encourage collaboration and the exchange of creative ideas. SPECTRE Arts believes that art is a vital form of communication and social engagement, and, thus, we are dedicated to promoting contemporary visual and performative practices by stimulating dialog between artists and community.